BEIT JALA, West Bank, April 2  Israeli troops backed by tanks and helicopter gunships today fought fierce day-long battles with Palestinian militiamen in the narrow stone streets of Bethlehem, the birthplace of Jesus Christ, while the intense bombardment of a Palestinian security compound in Ramallah ended with a U.S.-brokered surrender deal for hundreds of Palestinian gunmen inside. With Yasser Arafat, the Palestinian leader, still confined to two rooms of his former headquarters compound in Ramallah, Israeli Prime Minister Ariel Sharon offered a way out for his longtime nemesis; Arafat could leave to go into exile abroad, Sharon said, but could not come back. Palestinians immediately rejected the offer, and U.S. Secretary of State Colin Powell said he was opposed to the idea. By nightfall, Israeli helicopters were hovering over Manger Square and Israeli troops had fought their way to the doorway of the Church of the Nativity, one of Christianity's holiest shrines, where more than a hundred Palestinian militiamen, along with some civilian refugees, were reported to be holed up inside. This fifth day of Israel's massive military offensive against what it calls the Palestinian's "terrorist infrastructure" saw a dramatic expansion of the operation, with Israeli tanks tonight entering the Northern West Bank city of Jenin  which Israeli officials in the past have called a haven of terrorists  and F-16 jets pounding suspected Hezbollah positions in South Lebanon. The action in the skies over Lebanon came after Israel said Hezbollah guerrillas fired a Katyusha rocket early today into the Northern Galilee, raising the prospect that the Mideast violence could spiral into a wider regional war. Israel launched the operation  it's largest military campaign in two decades  after a spate of suicide bombings, sniping incidents and terrorist attacks that killed 125 Israelis in the month of March alone. Although today was the first day in a week with no suicide bombing reported, the Israeli civilian death toll still rose as two more victims died of wounds suffered from last Wednesday's bloody Passover bombing in Netanya. The deaths bring the number of dead from that one incident to 24, the highest toll in the 18-month-long Palestinian uprising. Last Friday, Sharon and his security cabinet declared Arafat "an enemy" and called up 20,000 reservists for what it said would be a drawn-out campaign to "uproot" the terrorist infrastructure in the Palestinian territories. Today, however, Israeli troops met the fiercest resistance of the operation so far in Bethlehem, an ancient hillside town of stone houses and winding narrow streets. Palestinian sources in Bethlehem and here in the suburb of Beit Jala described how in the early morning hours, the Israeli tanks and armored vehicles had difficulties navigating the town's narrow streets, giving a temporary advantage to Palestinian gunmen who took up positions on rooftops and inside buildings. 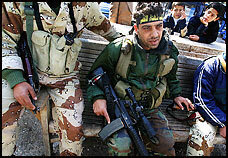 Israel claimed the gunmen were also firing from churches in the predominantly Christian town. From here in Beit Jala, the running gun battles in Bethlehem could be heard throughout the day and into the early evening, and the fighting continued throughout a raging thunderstorm that brought high winds. Some journalists and foreign peace activists were pinned down inside the Star Hotel, about a five minute walk from Manger Square, and said they could not venture outdoors because of the intense firing. The firing had tapered off by nightfall. "I hear occasional gunfire," said Joshua Hammer, the Jerusalem bureau chief for Newsweek magazine, who was spending the night in the Star Hotel. "I don't want to stick my head out the window for a better look." He said there was no electricity in the hotel and "the center of the city appears completely blacked out." Israeli troops had reached the doorway of the Nativity Church after dark and were ordering all men between the ages of 15 and 40 to come out, according to witnesses in the besieged town. It was unclear whether the Israeli troops intended to attack or otherwise storm the sacred Christian shrine. Israel officials said soldiers were under orders to avoid harming holy sites. There were also reports that a mosque that faces the church across Manger Square was briefly on fire, but the fire was contained. Palestinian gunmen, mostly from the Al Aqsa Martyrs Brigade, a militant off-shoot of Arafat's Fatah political faction, had vowed on the eve of the Israeli incursion that they would fight to the death if the city were invaded. They admitted that with only automatic assault rifles and grenades, they were no match for the Israeli armor and air power. Today's violence brought more civilian casualties. An elderly Palestinian security guard was shot and killed when Israeli troops first entered Bethlehem, according to Peter Qumri, a doctor who is director of the Beit Jala hospital here. There were also reports that a 64-year-old woman and her 38-year-old son died after they were shot by Israeli soldiers in the poor Bethlehem neighborhood of El Fawaghreh. They bled to death when they were unable to reach the hospital because no vehicles were allowed to move on the streets. A Palestinian cameraman working for the Qatar-based Al-Jazeera television station was shot in the neck and wounded while filming from the roof of the Star Hotel, Palestinian media sources in Bethlehem said. Israel said none of its troops were killed in today's fighting. In Ramallah, the local hospital was forced to turn an adjacent parking lot into a makeshift cemetery to bury 17 dead bodies that were piling up in the hospital's morgue and decomposing because the power supply had been cut. Israel briefly today lifted its curfew in Ramallah to allow panicked residents about three hours to venture to shops to stock up on food and supplies that were running low after the five-day siege of the city. The ongoing violence here appeared to be taking an economic toll as well. World oil prices hit a six-month high on concerns that the unrest could spread in the region. Meanwhile the Israel currency, the shekel, plunged today against the U.S. dollar to 4.78.